Buildings are the ideal canvas for you to increase the brand awareness of your business. 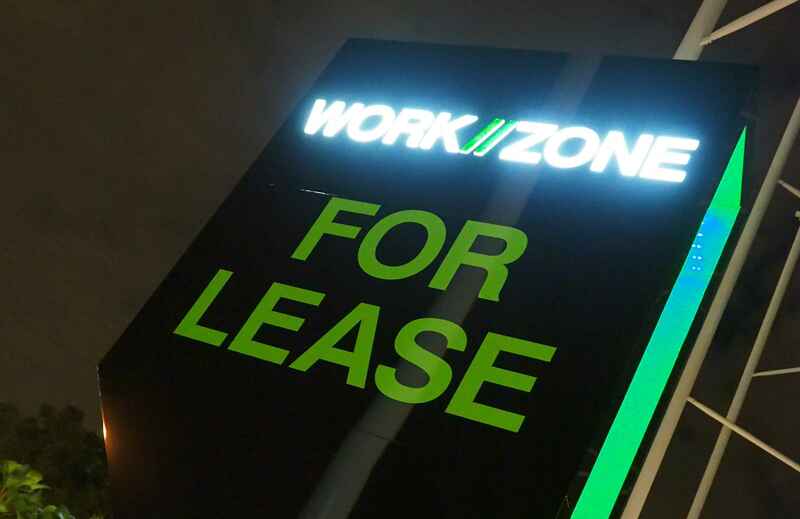 Using bold building signage, you not only identify your place of work and make it easy for clients to find, but you now have a large scale, highly visible advertisement for your business that runs 24/7. Corporate signs and commercial signage have enormous potential reach. They usually sit on street-facing buildings and can be seen by anyone who drives or walks past. We are able to reproduce your logo with any added words or creative graphics that you require, attracting public attention and increasing awareness. The bolder and funkier your sign the more attention it will attract. Contact us for a quote. The taller your building the more options you have for signage and branding. The upper reaches will be visible from greater distances extending your advertising reach and helping establish your presence in a particular area. An eye-catching colour scheme can be painted to enhance any signage. When you have a really large wall for your business signs or commercial building signage, you can add more than just a logo and business name. You can also add in additional information about any products and services that you offer, as well as contact details and opening and closing times. No matter what size your company is, we can produce a range of corporate signs to suit all your marketing and branding needs. We understand the corporate culture and what is required in terms of signage and branding, and we can produce a package of corporate signage that you can use wherever and however you want. Just let us know what you need and we will deliver a high-quality product that is useful, effective and affordable. When it comes to corporate sign solutions – look no further than Signs Ahead. Make sure your name and brand sticks out wherever you place it. When it comes to commercial signage for your business, you want signage that matches your image. You want your company signage to be visible but also unambiguous. You want people to instantly know what they are looking at, so that next time they see your logo or name, they recognise it instantly. We provide the ideal commercial building signage for all sized buildings and any sized branding. Build your brand with the biggest advertisements you can imagine. Using hi-resolution visual communication signage at your office building makes it easier to navigate for visitors and provides an outstanding branding opportunity. We specialise in manufacturing office signs that are tailored to your business, your building and your brand. With a talented and experienced team of designers, we can produce custom graphics for your office building, ensuring that you stand out from the crowd. It also allows everyone to easily find their way around your building. Contact Signs Ahead for our professional building sign design services and high-quality office building signs.